How about travel arrangements for accommodation and transportation? Travel arrangements, availability from here. This is for overseas runners include Japanese residing outside Japan. Only individual entry is available for oversea runners. Participants who miss cut-off times for each checkpoints or the goal will be disqualified from the race. If you receive a stop instruction, please remove your race number card. Choices will be given either to continue along the side of the road obeying all pedestrian laws, or to be picked up by an official bus for the participants. Healthy men and women aged 6 and over and primary school students. However, full and half marathon is a high school student and over 16 years old. Please pay the following fee as expenses of number card, program production fee, participation awards and insurance fee. We will give original towel to all participants. 1)Men : Top 6 runners for each categories except 3km Run. 2)3km Run for Men : Top 3 runners. 3)Women : Top 3 runners for each categories. 4)Family Run : Top 3 runners. However, the category of elementary school students (age 6 years old to 12 years old )will be presented to the top 6 runners. At the awards ceremony, awards will be presented to the top 3 or 6 runners in the categories described above. Also, Japan Airlines round trip tickets will be presented to 4 male and female winners of full marathon and half marathon. (The section is optional). 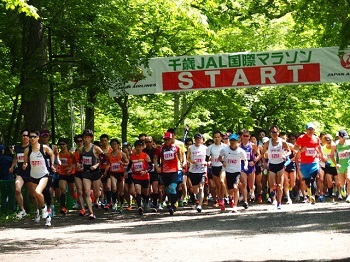 "Pair trip HAWAI 5days " organized by JAL pack" as Special prize will be given to ONE runner from both finishers of Full marathon and Half marathon who will participate lottery event that will be held at 15:00 on the event day. Also,the both Male and Female who are certified as good performer and live in Chiba prefecture,will be dispatched to Ibusuki-Nanohana Marathon as Sister City prize. 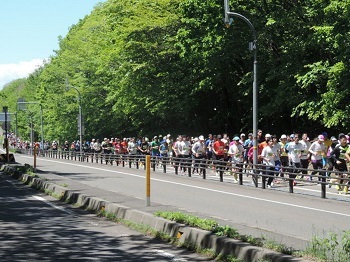 The 38th of grade runner from full marathon will be invited Shimada-Oigawa marathon. ○If the last two number in your number card is "38",your will be received original T-shirt as Lucky Awards. ○Over 80 years runners and the youngest runner from Family entries will be received the memorial prize. ○The special lottery event is planed that you will get local specialties and sports goods. ●We will issue certifications of completion as soon as the race is over. 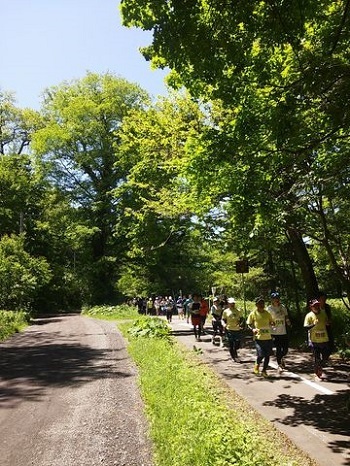 ●The full and half marathon courses cross the Doudou Shikotsuko Kouen Line twice (after the 33rd kilometer in the full course and after the 11th kilometer in the half course). Runners may be stopped for safety reasons, so please follow the instructions of the officials on site. ●We will present T-shirts commemorating the completion of the race to all participants who finish the half or full marathons. ●We do not have a wheelchair section at this event. ●You can leave your valuables at the storage location (free of charge; to be placed in one A4-sized envelope). Please keep other luggage under self management. ●We recommend bringing your health insurance card, in case of injury. ●There will be a bus running round trip from the event grounds (near the Chitose City library) to JR Chitose Station and the factory parking lot at the Kirin Building Chitose, Hokkaidou (capacity: approximately 1000 cars). ●There is a limit to the number of cars that can be accommodated in the parking lot provided by the organizers, so we recommend carpooling and parking the factory lot at the Kirin Building, which has plenty of room, or coming by public transportation. ●We will not provide pain-killing and anti-inflammatory sprays at this event. Please prepare your own if necessary. ●Before the start of the 9:30 half marathon, we’ve frequently seen 3 km runners taking up positions near the start line in order to secure front positions for their race. It’s very dangerous if you get caught in the crowd at the start of the marathon, so we ask that you please wait at the location indicated by the officials on site until 10 minutes before the race. For the purpose of contributing to more efficient operation of the event, personal information may be used by the organizers, or supplied to cooperating/supporting organizations, to deliver the participation guidelines, results notifications, related information and next year’s event notification, to announce race records and for emergency measures and collaboration among medical service facilities, as well as for providing services by event sponsors and cooperating/supporting organizations. The organizers or outsourcing contractors may contact participants to confirm application details. ※All applications for are under the consent of the terms and conditions listed below. 1. We will not acknowledge any cancellations or modifications due to personal circumstances, once you’ve submitted your application, nor will we compensate any over-payments or duplicate payments. 2. We will not offer refunds in the event that the convention is cut short or canceled due to earthquakes, storms, floods, snowfall, accidents or illnesses. 3. I am not ill, nor am I dealing with heart problems, and I’m in healthy condition and have trained sufficiently to participate in this event. Participants are responsible for their own health during the convention. 4. In the event that a problem occurs and a competition is put on hold, I will obey the instructions of the event organizers. Similarly, I will follow any instructions given by the safety and management personnel. 5. In the event of injury or illness during the convention, I will not object to the supplied first-aid treatment. The organizers are not responsible for the methods or processes used in treating participants. 6. I exempt the organizers from responsibility for any accidents, losses or injuries during the convention, and I will not demand any compensation for damages. 7. I acknowledge that reparations for any accidents or injuries during the convention fall under the insurance purchased on the convention’s side. 8. (In the case that the participant is a minor:) My legal guardian has consented to my participation in this convention. 9.I will not lie about my age or gender, and no one else will attend this convention in my place. If any such falsifications are discovered, I will accept any decisions by the organizers, such as revoking any rewards I receive and losing the right to participate in any future events. I also acknowledge that the organizers are completely exempt from responsibility for refunds or aid with regard to participants who falsified information. 10.I give permission for the use of any video footage, pictures, articles or recordings of the convention (which may contain my name, age, gender, picture or personal information) in media such as newspapers, television, magazines, pamphlets and on the internet. I grant usage rights of that material to the organizers. 11.The handling of participants’ personal information will be in accordance with the rules outlined by the organizers.